Last month, our News API gathered, analyzed, and indexed over 2.3 million news stories in near-real time, giving us the ability to spot trends in what the world’s media talking about and dive into specific topics to understand how they developed over time. The launch of the iPhone X. Looking into stories in the technology category, our News API detected a spike in stories published on the 12th of September. You can see that almost 5,000 stories about “Technology” were published that day – an increase of over 20% more than the average weekday. A large portion of these stories were covering the launch of the highly anticipated iPhone X. How did the media react to the iPhone X launch? Knowing that the launch of the iPhone X caused a spike in media interest is great because it lets us measure the hype associated with the event. But using the News API, we can go a step further and dig deeper into the content to better understand the media reaction. To do this, we used the Trends endpoint to analyze which entities were mentioned in all news stories. Using the Trends endpoint, our users can make an unlimited number of queries about quantitative trends in news content, making it easy to spot trending topics in a collection of documents. For example, take a look at what entities were mentioned most in stories about the iPhone X. On the chart above you can see that the media mentioned two types of entities the most: the most-mentioned entities are somewhat obvious and expected (Apple and iPhone). However, the articles also mention other entities like Tim Cook and Cupertino which help set stories in context, the “who, what, and where” of the story. But after these most popular entities, we can group some slightly lesser-mentioned entities together, these entities are competitor and product focused (Samsung, S8, Apple Watch). The prominence of these entities shows that the media was very interested in talking about the iPhone X in the context of how it added to Apple’s product offering, and how this offering compared to its competitors. How did the reaction on social media compare? So when it came to the iPhone X, the media were talking about Apple and its competitors, but what were people online talking about? We decided to compare the media coverage from the News API with reaction on Twitter to try and gauge the customer reaction to the launch. To do this, we used the Twitter API to gather 10,000 Tweets and our Text API to extract the entities mentioned in every Tweet. On Twitter, the 140 character limit means people have to jump right into what they want to say, so you can see right away how the content of Tweets differed from the content of news stories. You can see here that the conversation on Twitter we found was more focused on the product itself than the business implications for Apple. You can see this in the fact RAM is the most mentioned entity (the iPhone X has no increase in RAM from previous iPhones), while OLED, iOS, and the Galileo GPS system are much more prevalent here than in the News API results. So from this data, you can see that Twitter users were more focused on the product itself – making them a good insight into the voice of the customer, whereas the media were more focused on producing insights into the business implications of the phone. In a previous blog, we used our News API and our Text API to analyze how Ryanair handled the initial announcement of their flight cancellations disaster. As we wrote that blog only days after the announcement of the cancellations, we decided to check in with the airline again to see how they’ve fared since then. Below, you can see the volume of stories published about Ryanair in September and their sentiment. The first spike in extremely negative press covers the weekend that the airline announced the cancellations, and the second spike is the coverage of the announcement of further cancellations. Was it only the Cancellations that Brought Coverage for Ryanair? In the chart above you can also see a spike in stories about Ryanair on the Thursday following the initial announcement. To find out what all of this coverage was about, we used the Trends endpoint of the News API to find out what the most-mentioned entities in Ryanair stories were in the week following that big spike caused by the cancellations announcement. You can see above that all of the most-mentioned entities are aviation- or Ryanair-related. This is useful, as it gives us insight into what other people and places were talked about in the Ryanair coverage, but it doesn’t give us an insight into what the story spike was about. To do that, we’ll analyze the same time period with the keywords feature. The keywords feature produces a different kind of insight into text data: whereas the entities feature returns specific things like people, locations, and products, the keywords feature will return mentions of things in general like ‘flights,’ ‘week,’ and ‘pilots’. Take a look at the chart below to see the insights are different from what the entities endpoint returned on the same data. You can see in the chart above that the keyword ‘pilots’ is more prevalent than ‘cancellations,’ so we can guess that in the days after interest in the cancellations dies down, the media became more interested in the story about pilots leaving Ryanair en masse than the cancellations. To test this idea out, we used the News API’s Time Series endpoint to compare mentions of each of these keywords in stories with ‘Ryanair’ in the title. You can see that although the two issues were covered a lot together, coverage of Ryanair’s pilot trouble was more popular in between Ryanair’s two cancellation announcements. This shows that despite the huge coverage on passenger outrage, the media focused on the more troubling business news for Ryanair – its toxic relationship with its own pilots. 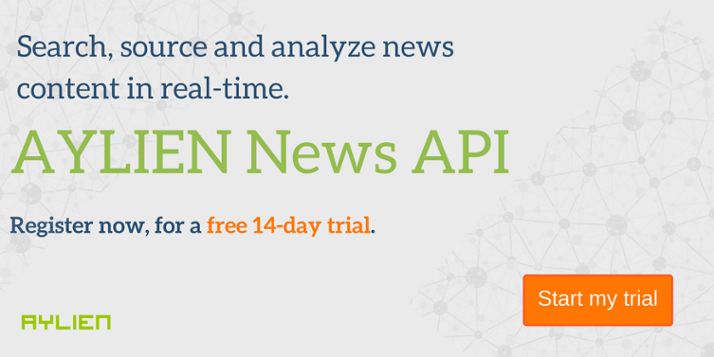 So that concludes our quick analysis of last month’s news with the News API. If you’re interested in using our AI-powered text analysis engine to analyze news content for your own solution, click on the image below and sign up for a free trial!